The refugee self organisation „The VOICE Refugee Forum“, together with the „Caravan for the rights of Refugees and Migrants“ and other migrants‘ and antiracist groups, is organising action days in Berlin against the collaboration between embassies and German authorities for deportations. The embassies of Nigeria and Guinea, due to their corrupt practices and dubious „identifications“, are a focus of protest. The highlight of the action days is a demonstration on Thursday, 10th of May, starting at 11 am in front of the Nigerian embassy (Neue Jakob Str. 4), passing by German foreign ministry. 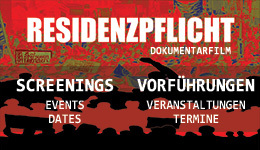 In the evening, there will be the cinema premiere of the film „Residenzpflicht“ at Babylon Cinema. Besides this, there will be workshops, presentations, theater, poetry, performances, creative actions, and a refugee conference on Friday. Many refugees are going to come from refugee camps in different regions of Germany (Baden Würtemberg, Bavaria, Thuringia, Niedersachsen and Sachsen Anhalt). A deportation is only possible if a state is ready to „take back“ the person concerned. For this purpose, German authorities buy passports and traveling certificates from the embassies of the countries where people are getting deported to. Refugees are forced to be interviewed by embassy officials to confirm their origin and identity and finally issue them traveling certificates. Centralised hearings are organised at changing places in order to accelerate the whole procedure. The deportation hearings were an aim of numerous protests by refugee communities. Many people who were summoned have successfully boycotted these appointments. Salomon Wantchoucou of Möhlau Refugee Initiative points out: „In the refugee camps, there is big fear to be summoned to the embassy by the police by force and afterwards to be deported. Our aim is to encourage people that resistance is possible and that they can defend themselves against their own deportation. You can contact us for questions and interviews (see contact on top!). During the action days, starting on Wednesday, 9th of May, at 2 pm, there will be a central info table at „Neptunbrunnen“ in front of the „Rotes Rathaus“ townhall.